Taylor Korobow, who so delicately and lovingly directed The Quality of Life in 2016, returns to Cinnabar to stage this deeply affecting play about the interaction of identity, psychology, and pathology. Jamie’s life in Brooklyn seems just fine: a beautiful girlfriend, a budding journalism career, and parents who live just far enough away. But when a possible childhood trauma comes to light, lives are thrown into a tailspin. Deeply compassionate, THE GREAT GOD PAN tells the intimate tale of what is lost and won when a hidden truth is unloosed into the world. THE GREAT GOD PAN runs 80 minutes with no intermission. For your enjoyment, our lobby and concessions, complete with specialty cocktails and facilities, will open 45 minutes prior to curtain. Join us! We will be hosting a Talkback with the cast on Sunday, October 21 immediately following the show. Kate Brickley (Polly) is thrilled to be working in her second show at Cinnabar Theater with a wonderful cast and director and at a place she has always admired. Kate first appeared on the Cinnabar stage in last season’s Good People. She has performed around the Bay Area at Spreckels Theater, Main Stage West, 6th Street Playhouse, San Jose Repertory Theater, Porchlight Theater in Ross, and the American Conservatory Theater. She has also lived and worked in Seattle at such theaters as the Intiman Theater, Seattle Children’s Theater, ACT/Seattle, and Mercer Island Theater. She ran the off-campus program for the education dept. at Seattle Children’s Theater. And farther east, she’s worked in her home state of Wisconsin and in Reading, PA at the Reading Theater Project playing Lady Bracknell to her daughter Lily’s Gwendolyn. It was heaven. Some of her favorite roles have been Ma Joad in The Grapes of Wrath, the mother in John O’Keefe’s All Night Long, Big Mama in Cat on a Hot Tin Roof and the British mother in Kinderstransport. She’s thinking that Dottie in Good People is going to be right up there in her list of favs. Other jobs that fill Kate’s time are acting as a dialect coach for various theaters and groups. The best of all has been her volunteer work at San Quentin Prison in the Shakespeare San Quentin Program sponsored by Marin Shakespeare Co.
Taylor Diffenderfer (Paige) has been working professionally in Sonoma County theater for over 10 years now. She discovered her love of theater at the age of 9 with Cinnabar’s Young Rep program and is over the moon to be back on this stage again. Her last performance was as Orpheus in Sarah Ruhl’s Eurydice, at Main Stage West in Sebastopol. When she’s not acting she is playing with dogs, while working at Canine Companions for Independence. Susan Gundunas (Cathy) returns to Cinnabar after making her debut in 2016 as Dinah in The Quality of Life. Born and raised in the Bay Area, Susan began her acting career with San Jose Repertory Theatre and her career as an opera singer at Opera San Jose and has since performed over 60 theatre, musical theatre, and opera roles throughout the country and abroad. Consistently praised for her consummate vocal talent and stage presence, she has performed notable roles including the title roles in Madama Butterfly and Lucia Di Lammermoor, Violetta in La Traviata, Donna Anna in Don Giovanni, Carlotta in Phantom of the Opera (Germany), Mrs. Peachum in A Three Penny Opera, Lady Russell in Persuasion (San Jose Stage Company), Esther in MeshugaNutcracker and the role of Ellen in the world premiere of Nosferatu, recorded for Albany Records. This year Susan won critical acclaim for the starring role, Raisel/Bubbie in The People in the Picture and for her leading role in Sondheim on Sondheim at the new 3Below Theaters in San Jose. Richard Pallaziol (Doug) studied theatre at CSU Long Beach and the American Conservatory Theatre in San Francisco. Locally, he has performed here at Cinnabar (Amadeus, Quality of Life, The Creature), for Marin Shakespeare (Othello, The Three Musketeers, Pericles), TheatreFirst (HeLa), Napa Valley Conservatory Theatre (People’s Temple, Lydia, Eurydice), Shakespeare Napa Valley (Much Ado About Nothing, As You Like It), and for the Napa Valley Shakespeare Festival (Macbeth, Richard III, The Tempest) where he also directed (Taming of The Shrew, Hamlet). Richard has been a professional stage fight choreographer for the past thirty-eight years. Nick Sholley (Frank) is honored to return to Cinnabar. He was last seen here in last season’s Good People, as well as Is He Dead? (2010) and Enchanted April (2007). Recent productions in the area include A Steady Rain (2016/17) at Left Edge Theatre and Mainstage West, The Birds (2017) at Main Stage West, and Richard III (2015) and Ideal Husband (2014) at Marin Shakespeare Company. Last year, Nick directed both the adult and youth productions of Zombietown for Left Edge Theatre. Thanks and love to Thais and Sid for making magic everyday. Carly Van Liere (Joelle) grew up in Marin County before earning her BFA in Acting from the University of Michigan spring of 2018. Highlights from U of M include performing in The Resistible Rise of Arturo Ui, Hand to God, and Wild Honey, and studying post-dramatic theatre for a semester in Berlin. This is her west coast debut! Aaron Wilton (Jamie) is elated to return to Cinnabar, where he previously played Felix in The Odd Couple and Mozart in Amadeus. Recent credits include Bright Shining Sea (PlayGround SF/Potrero Stage), Silent Sky (Jewel Theatre Co), Luna Gale (Capital Stage Co) and Bootycandy (BACCE/Brava Theatre). He’s been acting for 25 years and has numerous credits in Film, TV, video games, commercials and regional stages, including Aurora Theatre Company, San Jose Stage Company, Pacific Rep, Theatre Rhinoceros, Sacramento Theatre Company, B Street, Shakespeare Napa Valley, George Street Playhouse, Hudson Stage Company and Shakespeare in the Wild. Aaron is a proud member of Actors’ Equity, The Dramatists Guild and SAG-AFTRA. Kristoffer Barrera (Sound Designer) has collaborated with several Bay Area theater companies on and off stage. He trained with the Fusion Theater Project at Laney College in Oakland, California under the direction of Michael Torres and Jim Cave. He continued professionally, working in booths, mixing musicals, and designing while jumping on stage here and there. A couple of years ago he joined TheatreFirst in Berkeley as production manager, where he was also the resident sound designer for the 2017-2018 season. Ellen Howes (Costume Designer) has worked in film, theater, dance, and fashion. While she primarily works as a costume designer, she often designs the props and sets for the projects she works on as well. As a costume designer particularly interested in subtle parody and satire, Ellen hopes to someday work for a sketch comedy series, but has been primarily working in live theater and fashion photo-shoots as of late. An eccentric soul with eclectic tastes, it was only natural that Ellen was drawn to design, a career that allows her to continue to learn and create well after her educational career. Ellen’s previous theater credits include My Way: A Musical Tribute to Frank Sinatra at Cinnabar. Taylor Korobow (Director) last worked at Cinnabar directing The Quality of Life in 2016. A director, producer, educator and media coach, Taylor has produced and directed countless projects, including theatre productions, commercials, computer games, corporate videos, etc. Taylor is co-founder of Groundswell: The International Theatre Intensive, which she facilitates with Jon Tracy. She is also co-founder of Stray Dog Presents, a theatre production company in San Miguel de Allende, Mexico, where she resides part-time. Taylor founded and directed The Voice Factory, an acting and voiceover school with four Bay Area campuses for over fifteen years. She has appeared on several television reality shows and has taken part in many panels and thinktanks regarding the art and profession of acting. Emily Newell (Assistant Stage Manager) studied Theater at Northern Arizona University, in hopes of pursuing a professional career in stage managing, but has relocated to Sonoma County in the past few months. She has most recently stage managed Neil Simon’s Rumors, John Logan’s Red, and Noël Coward’s Blithe Spirit, all housed at the Theatrikos Theater Company in Flagstaff, along with being an ASM for NAU Theater’s production of Tennessee Williams’ Summer and Smoke. This is Emily’s first show with Cinnabar and is very grateful for her opportunity to help bring this show to life! Ross Tiffany-Brown (Stage Manager) has been working on all facets of technical theater in Sonoma County for the past decade. He received his Bachelors Degree from Sonoma State University. You may have seen him Stage Managing, Set Building, Light Hanging, Sound Crunching, Wall Painting, Note Taking, and Button Pushing for productions at Cinnabar Theater in Petaluma, Spreckels Performing Arts Center in Rohnert Park, The Green Music Center and Sonoma State University’s Department of Performing Arts, Main Stage West in Sebastopol, and various other theaters in Sonoma County. The entire ensemble is superb with Wilton giving a tremendous performance as Jamie, a man whose very structured life is on the verge of collapse as he seeks answers to the questions raised by Frank. Those questions hover over the play like the forest-like set pieces designed by Jon Tracy. Tracy’s set is a terrific physical manifestation of the fluidity of memory, and the cast’s interaction with and manipulation of it is a mesmerizing component of the show. An intriguing story, riveting performances and striking design combine to make a show that, once seen, is not easily forgotten. Herzog weaves two-person scenes over 85 minutes into an intriguing inquiry into the vagaries of memory, but more so into the ripple effect of childhood sexual abuse, in the victim’s life and adult world. The play handles delicate subjects with a thoughtful, subtle approach, letting information surface gradually, serving up more questions than answers. Jamie tries to casually question his parents, Cathy (Susan Gundunas) and Doug (Richard Pallaziol), which is more like dropping a grenade in their peace of mind. He visits Polly, whose growing dementia complicates matters of memory. Jamie and Paige have their own issues—or, are those problems somehow related? Paige’s social work practice includes a client with anorexia (Joelle, played with remarkable authenticity by Carly Van Liere). Knowing Herzog, these scenes are no accident, adding another layer of examination. Might it have to do with evidence that over 50% of patients with eating disorders report childhood sexual abuse? This could be dark and dreary, but director Taylor Korobow’s production brings out excellent performances from her cast, and, while thoughtful, never feels slow. The brilliant set and lighting design by Jon Tracy combined with haunting sound design by Kristopher Bererra become like another character in the play, rotating perspective, stranding us in the dark woods of shadowy memory, illuminating shifting ground and trees that won’t remain in place. It’s a terrific concept as backdrop for a talented ensemble of actors. Wilton carries the play as Jamie, working his way through difficult transitions and conflicting emotions with utter believability. He’s aided by a fine cast, all bringing their characters to life with a kind of fierce faithfulness, a determination to avoid false notes. Their pauses speak volumes, their hesitations measure deliberation and pain. Yet they also know exactly how to deliver the bits of comic relief Herzog allows. It’s a superb production from start to finish, sure to generate appreciation for the show itself, but also deep reflection on an issue currently in the national newscape. That Herzog wrote the play in 2012, and that Cinnabar presciently included it in the current season is rather remarkable; it couldn’t be more timely. Is past trauma best left buried, or is it worth piecing together fragments of memory to understand the truth? In Amy Herzog’sThe Great God Pan, Jamie (Aaron Wilton) is confronted with the possibility that he was molested as a child. His confident denial disintegrates under closer inspection, leaving him haunted by the possibility that it really happened. It is easy to feel for Jamie’s dark journey, yearning that he will be unaffected and safe. Silence is a powerful tool in the hands of director Taylor Korobow, who emphasizes poignant moments with methodical staging. She allows characters to process the layers of emotion in their scenes, remaining quietly in the background as the story progresses. Conversations flow naturally, occasionally talking over each other, rather than using the artificial politeness that permeates most plays. There are odd pauses mid-sentence, exuberant discussions, and conspicuous body language left in rough honesty, rather than smoothed into polished language and elegant interactions. Jamie’s struggle for answers affects those closest to him in discordant ways. Mildly judgmental Cathy (Susan Gundunas) finds herself consumed with guilt for not protecting him, and takes to wandering through the neighborhood at 1 a.m. jabbering incoherently on the phone. His girlfriend, Paige (Taylor Diffenderfer), has her own inner demons to worry about, and calls him out on his lack of communication. “You listen, you don’t act.” She points out that relationships take work on both sides, and wonders if the last few years were a wasted effort on her side, since he refuses to take their life together seriously. The couple’s passionate, tense exchanges are riveting with fervent connection. Suspended tree trunk pillars sway as actors push through them – their mesmerizing movement visually intriguing and evocative. Jon Tracy’s set and lighting design is stark with touches of natural elements. Dappled patterns are elemental, racing into harsh shadows when the mood shifts. A technical design of gentle rain, flickering lights, and blaring traffic, created by Kristoffer Barrera, is used with a surgeon’s precision. The Great God Pan is uncomfortable at times, but with relatable characters who behave in a realistic fashion, displaying outbursts of cruelty and tender extensions of love. The level of commitment and vulnerability required of the actors is extensive, and the cast is fully immersed in their roles, from Nick Sholley’s nervous, jittery breakdown (he plays Jamie’s friend, who initially brings the accusations of abuse to light), to Richard Pallaziol’s courageous revelations late in the play. 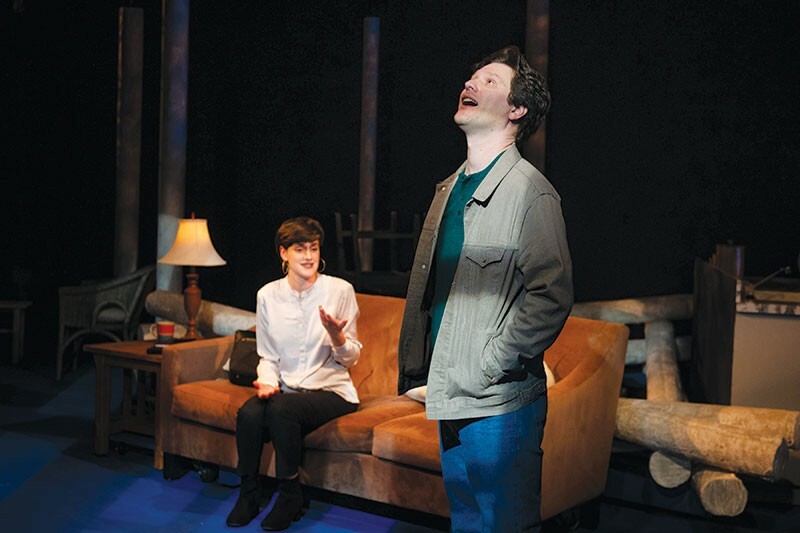 Throughout the story, playwright Herzog takes on eating disorders, depression, suicide and addictions in a mounting quandary, alleviated by swiftly passing moments of humor. Unfortunately, the constant shifts in emphasis and content prevent the production from becoming truly gripping. Transitions are awkward and confusing, adding to the sense of disquiet. Still, Herzog uses that uneasiness to force contemplation of difficult themes in a thought-provoking tapestry of trauma. Running 80 intense minutes without intermission, this is a memorable and provocative experience.